roundup | More blue fabric? I did it! 31 days of me made items! I’m really pleased I stuck with it all the way through, as I had a real sense of achievement in doing it. There were a couple of points where I very nearly couldn’t be bothered, but it was definitely worth it. God it’s boring to take your own photo every day. Because it isn’t just taking one photo, it’s taking lots. For most of the poses I used a timer setting, which takes a burst of ten photos. So you have to pick the best of those. However there might be as many as 10 timer shots taken to try and get the “best”pose. So that’s over a hundred photos to choose from. Every day. Boring. Turns out I really like green and blue items of clothing. Whodathunk? 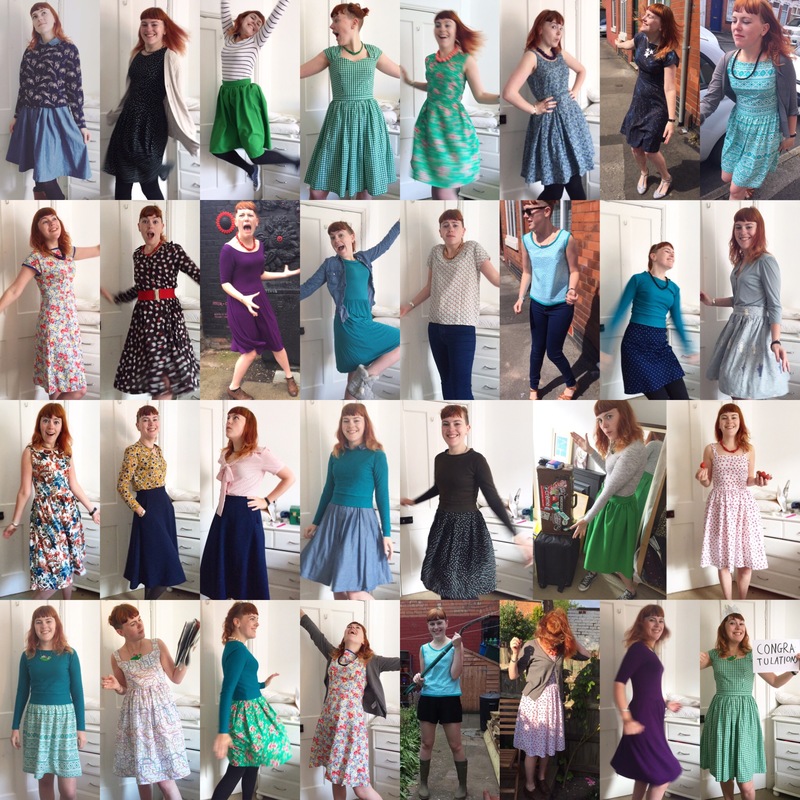 I’ve got a couple of key patterns that are proving great wardrobe builders; the Colette Moneta (days 8, 11, 12, 17, 25 and 30), the Gather Patterns Mortmain (days 2, 5, 22 and 27) and a basic gathered skirt pattern which, as well as being used for my green and polar bear skirts, is also the bottom of my strawberry dress. I’ve also got a couple of things that are lacking and that I really need to add in to the mix, especially trousers and casual tops. That said, I discovered the Colette Sorbetto top is a fab stash buster (days 14 and 21) so will be making a couple more and have patterns for both the Closet Case Ginger jeans and Sew Over It Ultimate trousers waiting for me to make. 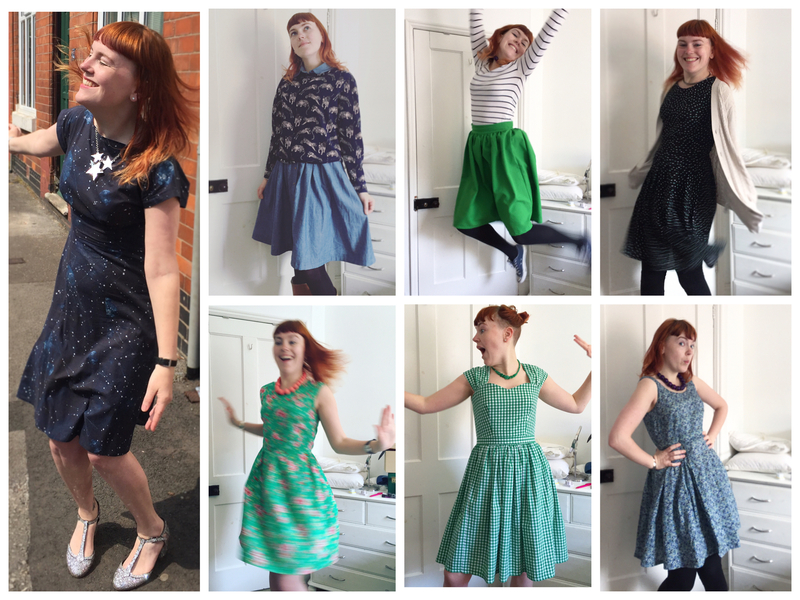 In spite of potentially needing to make more sensible decisions in my sewing, I blooming love making dresses and will still make them more than anything else, because they’re just more fun, and that, for me, is what sewing is all about! Three weeks down! 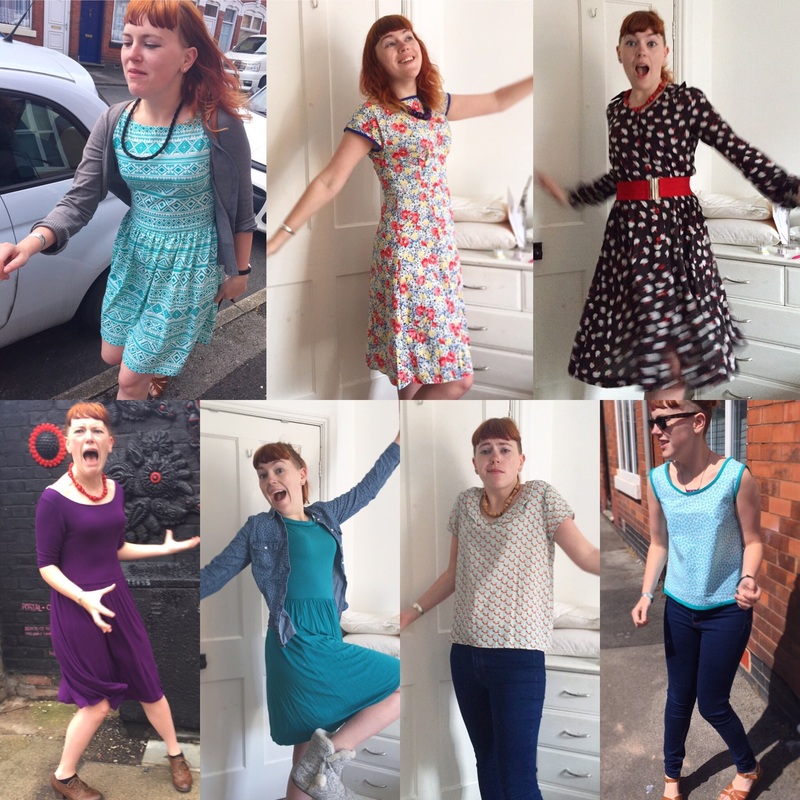 When I set out on Me Made May, I wondered how long I could go without repeats (and I don’t just mean my expression…). Turns out the answer was 20 days (if we ignore the repeated skirt on day 19!) and even then on Saturday I pulled out my sparkly Astoria and had another different item to add to the mix. This week has also tested my thinking about what I wear. 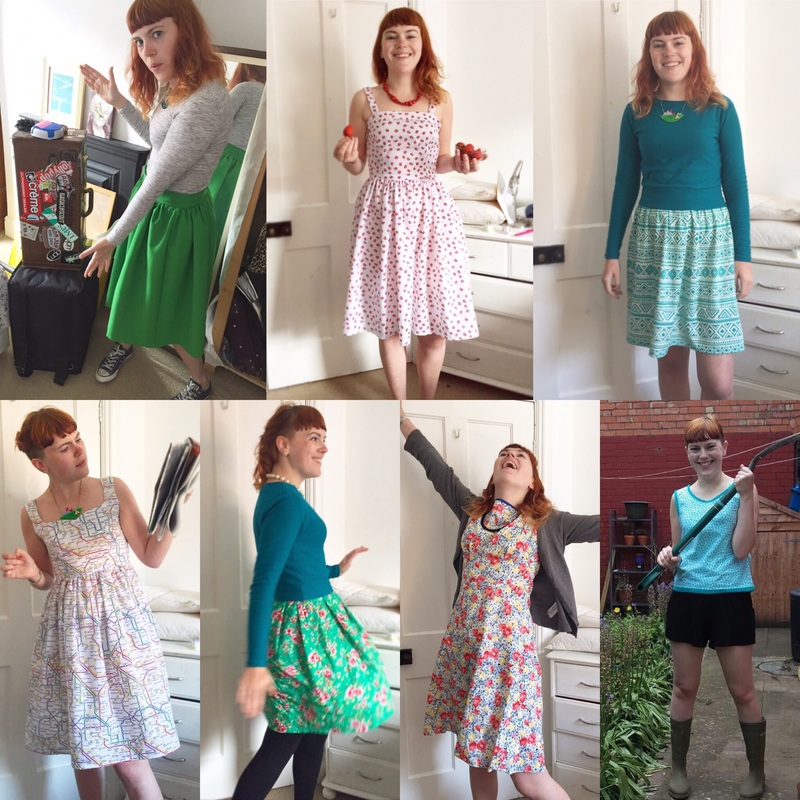 For me, Me Made May was about wearing something handmade every day, but wasn’t necessarily about wearing something different every day for a month. Whilst I’ve still got a couple of items that I’ve not yet worn as part of Me Made May, if I’m honest, I don’t think I will. Some of them is due to their status as “dressing up” items (looking at you unicorn dress and leopard print cape) whilst for others, as I made them when I first started sewing, I’m aware of the fit (or lack thereof!) compared to what I now make and wear regularly. What this also means is that for the last week (and a bit) of May I’ll be repeating (with the exception of a sneaky new make or two….) but seeing if I can style my outfits differently, rather than continuing to wear “new” items each day. Here’s hoping I make it to the end! So another week of May has gone by, and with it another seven days of me made clothes. What’s been interesting this week is that I’ve started to get towards the end of my handmade wardrobe. This has got me feeling slightly panicky; should I make more things to keep on having something new to show everyday? Should I wear some of the things I have that I don’t really want to wear but would mean I could avoid repetition that bit longer? Is repetition even a bad thing? Normally I wear an item two or three times over the course of a fortnight and no one cares, but then, normally I’m. not sharing the outfit I wear every day..
I’m not really looking for answers, but it has been thought provoking. It’s also made me realise I spend a lot of time wearing dresses usually, so my fondness for making them is actually a good thing rather than a total vanity project. 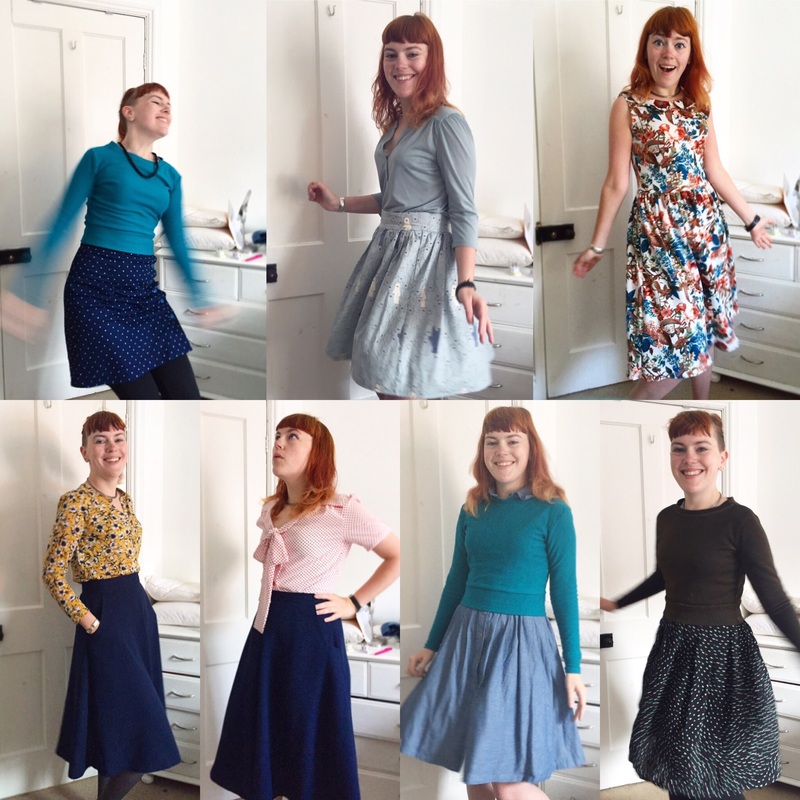 At any rate, this continues to be a fun way to explore my wardrobe, and I’m intrigued to see what weeks three and four will throw up (not least because I may have gone fabric shopping yesterday…. ).